Halter with savvy / touch horse with hands / stick and string rhythmically / with rope / plastic bag / flag / ball / saddle pad / saddle. In front of horse, beside horse, next to horse, further away and around horse. From gentle up to extreme familiarisation. Back up from chest and nose, up to 20 steps using pulsing pressure and always looking for lightness and NO BRACE in horse. Move forehand over (keeping hq’s still and also with hq’s moving slightly in a circle), using pulsing pressure – up to a full circle. Move hindquarters over (criteria as above but keeping fh still). Head down, using lightness and as much time as needed for understanding. Hand on poll and using light pressure on rope. Pick up feet using touch/squeeze of chestnut method…working towards being able to pick up all four feet individually from one side. Use alpha phases at all times (thought/energy/body cue/tap air in 4 phases up to to tapping horse in a non aggressive way…pulsing pressure). Walk backwards with pulsing pressure infront of the horse. Drive horse to obstacles/touch it – point 2 point, using driving game with you next to horse by neck/shoulder. With gently pulsing alpha phases and NO WIGGLING of rope unless blocking unwanted moves. Backup horse to end of 12′ and then 22′ lines and draw with line still on the ground. Yo-yo you and horse together in sychronised moves, keeping at least 6 paces between you both at all times. 22′ line – trot 2 laps left, change of direction (keeping gait), 2 laps to right then dhq. (or right first then left). 22′ line – moving circles to left, right and with changes of direction up and down field. *NB. remember COD’s are an engaged move which stay in gait NOT a disengaged move where gait changes..key to this is to be light on the rope when drawing and to walk backwards to draw..no pulls. 12′ line – by fence / through gateways large and small / into and out of stable. Horse should not go behind you at all, this game is a half circle in front of you each ending must be a GOOD DHQ, HALT & RELAX. Calmly at fence to start with. 12′ line – 6-10 steps left and right. Without fence: at least 10′ with very little forward motion from horse and very very little wiggling. pulse that energy. Stick 2 Me: Horse to follow your thought/energy/body cue (tap only if necessary), you in neck/wither area, lead with outside hand. Walk on / halt. Walk on / halt / walk on. Walk on / trot / walk / halt. Walk on / trot / walk / halt / back up. And all combinations of these 4 things. Work on Left and Right sides too. Make up reins with 12′ or 22′ line or use clip on reins. Sidle horse to mounting block. Lateral Flexion calmly at standstill, left and right. Then: LF and DHQ from a walk in small, safe area, building up to bk/h/w/t transitions looking for lightness and connection to breathing/energy/thoughts. ALSO something to not forget nor neglect is Undemanding Time and Mirror Your Horse. a) Undemanding Time: go sit with you horse in his environment (or walk companionably with in-hand grazing), make no demands, don’t ask him/her over, don’t interact unless he comes to you. This is time that can be spent reading or doing homework, watching dvd’s or YouTube and allows your horse to know that you can just ‘be with them’ without any agenda. b) Mirror Your Horse: this one you can do at liberty in your field or on a loose line in the field or with in-hand grazing outside your field. You need to totally give yourself up to mirroring your horse. Find out how he/she puts her front feet down, where is the weight distribution, how does he/she move the foot parts? What about his/her energy and breathing. Can you breathe with your horse. 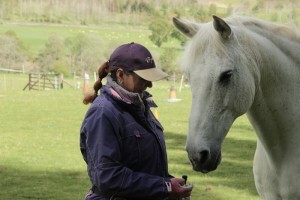 Can you stand totally still and relax or sleep with your horse and totally be with them in their world. This is a great exercise in connection and again allows you to be in their world without an agenda. See Blog ‘ARTICLES’ for more info on some of the above. It might be an idea to print this off and tick things when you’ve done them. Remember, this is just starting up so we’re just checking things are still there from last year and progress on all of the above and more can be done after these are in place with lightness, politeness, relaxation, willingness, impulsion and flexibility to the smallest degree, they’re just checks.